The rapid rise and costly fall of Health Republic Insurance of New York, the largest non-profit insurance “co-op” established under President Barack Obama’s federal health care legislation, is a cautionary tale for policymakers in Albany as well as Washington. Despite heavy federal subsidies and robust enrollment growth, Health Republic lost money at such a clip that state regulators forced it to shut down as of Nov. 30, on barely two months’ notice. The collapse disrupted coverage for 215,000 customers, stuck hospitals and other health providers with hundreds of millions in unpaid claims, and left federal taxpayers with a quarter-billion dollars of uncollectible debt. This was no isolated incident. Of 23 such insurance co-ops launched under the new federal health care law, 12 will be out of business by Jan. 1. That failure rate of more than 50 percent raises obvious questions about the workability of the co-op model and Washington’s management of the program. Of more direct concern for New York policymakers, however, is an apparent breakdown in state oversight of the health insurance industry. Health Republic’s growing financial troubles should have been no surprise to insurance regulators at the Department of Financial Services (DFS). The company’s filings to DFS showed steep operating losses, mounting debt, unanticipated costs and heavy reliance on a federal risk-management subsidy that failed to materialize. Yet the department did not intervene to order an increase in Health Republic’s premiums, as other states did in similar situations. To the contrary, DFS repeatedly cut the company’s premiums below what the insurer had requested, aggravating the co-op’s losses. The department’s most recent cut—trimming some of the plan’s proposed rates for 2016—was announced in July, less than two months before DFS moved to shut the insurer down. At the very least, this chain of events raises the question of whether the department’s regulatory judgment was clouded by the political desirability of keeping health insurance prices artificially low in the short term. It also highlights an inherent conflict between the department’s longstanding regulatory role—which is to assure that health plans are financially sound—and rate-setting authority granted by the Legislature in 2010. 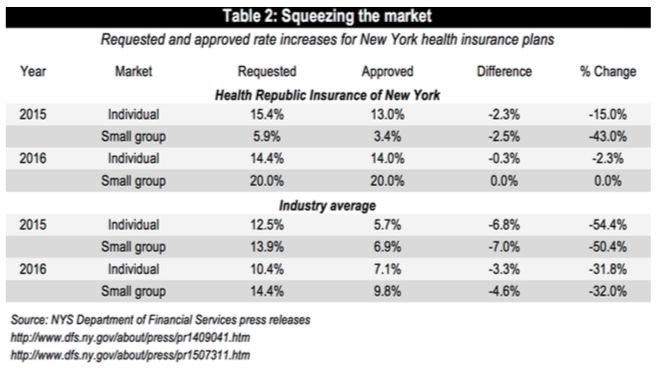 An analysis of premiums before and after the enactment of that law, known as “prior approval,” indicates that the law is having no clear impact on New York’s health insurance costs versus national averages. This suggests that consumers might be better off if DFS kept its entire regulatory focus on the financial health of insurance companies while leaving price-setting to market forces. The law sought to reduce the nation’s uninsured rate by, among other things, establishing purchasing exchanges in each state, through which individuals and small businesses can choose among a selection of plans, with tax credits available on a sliding scale to lower- and middle-income buyers. To facilitate comparison shopping, plans sold through the ACA exchanges must offer a standardized menu of benefits and are grouped into “metal levels,” ranging from “platinum” plans designed to cover 90 percent of medical costs, down to “bronze” plans that cover 60 percent. Co-op health plans would be set up as non-profit companies governed by their members, and would receive federal start-up funding in the form of low-interest loans. Health Republic Insurance of New York was founded as a co-op by the Freelancers Union, an organization of independent workers that had previously offered health coverage to its members. The Center for Medicare & Medicaid Services (CMS) accepted Health Republic into the program in 2013 and authorized financing of $174 million, the most awarded to any co-op. When New York’s exchange opened in September 2013, Health Republic stood out in two ways–for its unusually broad provider network and for its extraordinarily low premiums. While other plans sharply limited what providers their members could use as a way of controlling costs, Health Republic’s network included Manhattan’s Memorial Sloan Kettering, the world-famous cancer treatment center covered by few, if any, of its competitors on the exchange. Health Republic’s prices for 2014, meanwhile, ranked at or near the very bottom of the scale, and were sometimes significantly out of line with those of other plans, as shown in Table 1 below. 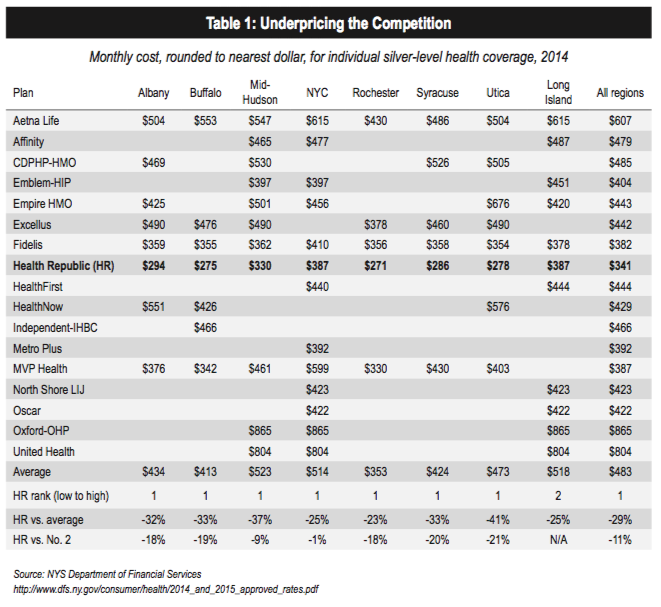 For “silver” coverage, the most popular option, Health Republic’s 2014 premiums were the lowest in seven of eight regions of the state (the exception being Long Island, where it was second-lowest.) In the Syracuse area, its silver rate for calendar year 2014 was $286 a month, 33 percent below the regional average and 20 percent lower than the next cheapest plan. Early on, some of Health Republic’s competitors—without mentioning the company by name—publicly questioned whether premiums offered through the exchange were excessively low. In a conference call with investment analysts in April 2014, UnitedHealth Group CEO Stephen Hemsley spoke of an “underpricing dynamic” in New York. That Health Republic was indeed running in the red was confirmed by its quarterly filings with federal and state regulators. The statement further reported that Health Republic had recently drawn two additional federal loans of $38 million each to replenish its required cash reserves. The first was back-dated to Dec. 31, 2014, the second to March 30. That brought its total solvency financing to $209 million and left just $32 million more available. The statement listed a “premium deficiency reserve” of $21.9 million, corresponding to how much the company expected to lose because of low premiums in 2015. Plus, the company was banking on $119.9 million in payments from the ACA’s “risk corridor” program—most of which is was unlikely to collect, as will be discussed further below. In another potential sign of trouble, several key numbers in the May filing were significantly worse than those the company submitted in an unaudited statement two months before. Given the unpredictability of who would buy coverage through the exchange in that first year, and how healthy or unhealthy they might be, Health Republic was far from the only participating plan to set its premiums too low. Anticipating that problem, the ACA included risk-protection provisions known as the “three Rs”: reinsurance, risk adjustment and risk corridors. For Health Republic, however, the latter two programs backfired. Under risk adjustment, plans that enroll relatively healthy customers must transfer some of their revenue to plans with relatively sick customers. Despite including Memorial Sloan Kettering in its network—which might have been expected to attract patients with cancer—Health Republic was deemed to have a relatively healthy customer base, and therefore had to give up $44 million during its first year, aggravating its financial woes. The third “R,” risk corridors, proved especially troublesome for Health Republic. Under this three-year program, federal officials set a target for what share of premium revenue plans should spend on claims. Plans that underspent the target by more than 3 percent were required to turn over part of the unused funds to the government. Plans that overspent the target, meanwhile, were supposed to be partially reimbursed for their losses. In an April 2014 policy memo, CMS projected that plans’ surpluses and losses would be more or less equal, and declared its intention to run the program on a “budget neutral” basis (i.e., without the use of federal tax dollars).9 If funds ran short, officials said they would reduce payouts to plans accordingly and try to make up the shortfalls in subsequent years. By protecting insurers from the downside risk of excessively low premiums, risk corridors created a classic moral hazard. Health Republic, among others, fell prey to it. At that point, insurers counting on big risk corridor payouts, Health Republic among them, faced a reckoning. In a May 2015 report spotlighting the issue, Standard & Poor’s (S&P) included Health Republic on a list of companies that stood to lose the most from the shortfall in the risk corridor program. At the time, S&P put Health Republic’s liability at $58 million, based on the company’s most recent filing. In its audited statement a few weeks later, however, the company would more than double that estimate to $119.9 million. It was increasingly clear that Health Republic would collect only a fraction of what it was due. Officially, though, the full amount appeared on its balance sheet as a “receivable,” helping make the company look solvent on paper. And the more money Health Republic lost on operations, the bigger that theoretical asset grew. When the company filed its June 30 quarterly report, its “receivable” from risk corridors had mushroomed to $243 million. The exact amount of Health Republic’s risk corridor losses remained unclear when its shutdown was ordered on Sept. 25. Six days later, CMS announced that it would reimburse companies just 12.6 percent of what they were owed under risk corridors,14 wiping almost $200 million from Health Republic’s books. The Department of Financial Services was created in 2011, when Gov. Andrew Cuomo merged the former Department of Insurance with the Department of Banking. Among its specific goals is to “ensure the continued solvency, safety, soundness and prudent conduct of the providers of financial products and services.”15 In keeping with that charge, the department collects and reviews detailed financial reports from all insurers, including health plans, to make sure they are maintaining adequate reserve funds and otherwise operating prudently. First, the state requires health plans to spend a minimum share of their annual revenues on actual claims, as opposed to administrative expenses and profit. This “medical loss ratio,” or MLR, is 85 percent for large-group policies and 82 percent for small-group and individual policies. (Within New York, these rates supersede the ACA’s loss ratios, which are 85 percent and 80 percent, respectively.) Plans that fall short of meeting the applicable MLR must pay refunds to their customers the following year. In principle, DFS could use this authority to raise rates as well as reduce them. In practice, the department’s rate adjustments have gone in only one direction—down, sometimes dramatically so. Overall, as shown in Table 2, the plans applied for increases averaging 12.5 percent for individuals and 13.9 percent for small groups. DFS’s actions knocked both down by more than half, to 5.7 percent and 6.9 percent, respectively. The department was somewhat less aggressive in 2015, when it set rates for 2016 coverage. This time, it approved five of 17 individual rates and eight of 19 small-group rates without changes.19 Still, it lowered the average increases by almost a third, from 10.4 percent to 7.1 percent for individual policies, and from 14.4 percent to 9.8 percent for small group policies. Although Health Republic’s premiums were already among the very lowest in the state—and though its financial reports showed it was losing money—the fledgling company did not escape the state’s rate-setting knife. During the 2014 approval process for 2015 rates, DFS lowered Health Republic’s individual rate increase from 15.4 percent to 13 percent and its small-group rate increase from 5.9 percent to 3.4 percent. In July 2015—two months after Health Republic filed its grim audited financial statement—the department still saw fit to slightly lower the company’s requested rate hike for individual policies, from 14.36 percent to 14.03 percent. For small groups, however, the department granted the company the full 20 percent rate hike it sought. In contrast to New York’s DFS, some other states’ insurance regulatory agencies have used their rate-setting authority to increase premiums as well as lower them. Had New York’s regulators ordered higher rates for Health Republic from the beginning, the company could have avoided some of the steep losses that made it so dependent on risk-corridor funding. While it’s unclear that such action would have been enough to save the company, DFS’s rate-cutting, in retrospect, was unquestionably counterproductive. New York’s market is very competitive, and plans submitted rates that were as low as possible while still being actuarially sound. There are serious concerns that DFS’s decisions will create unnecessary turmoil in the market and will lead some plans to make business decisions that might include eliminating or reducing product offerings, withdrawing from regions, or even withdrawing from the marketplace entirely. The shutdown of Health Republic harms three groups of stakeholders: consumers, providers and taxpayers. The company’s 215,000 subscribers—about one fifth of all New Yorkers who bought private coverage through the state exchange—faced a double whammy: they had to scramble to switch plans on short notice, then, in most cases, pay significantly more than Health Republic’s too-good-to-be-true premiums. At first, subscribers were told their coverage was good through Dec. 31, meaning they could shop for a new plan during the standard open enrollment period for 2016. Then they learned Health Republic was closing Nov. 30, meaning they also needed to arrange a single month’s coverage for December. While DFS arranged an “automatic enrollment” option to streamline the process, it’s likely that at least some Health Republic customers were lost in the shuffle or chose to drop coverage. The hospitals and doctors who treated those customers, meanwhile, are stuck with millions in unpaid bills. The company’s June 30 financial filing reported $184 million in outstanding claims, a number that would have grown since then. Taxpayers, meanwhile, are unlikely ever to be repaid for the $233 million the federal government loaned to Health Republic. Beyond the potentially damaging effect on health plan finances, does New York’s prior-approval law achieve its goal of making coverage more affordable in the long term? An analysis of insurance costs with and without the law in place suggests the answer is no. Under prior approval, which existed in New York before 1996 and was reinstated in 2010, health insurance companies must submit their premiums for individual and small-group coverage to state regulators for review and approval. 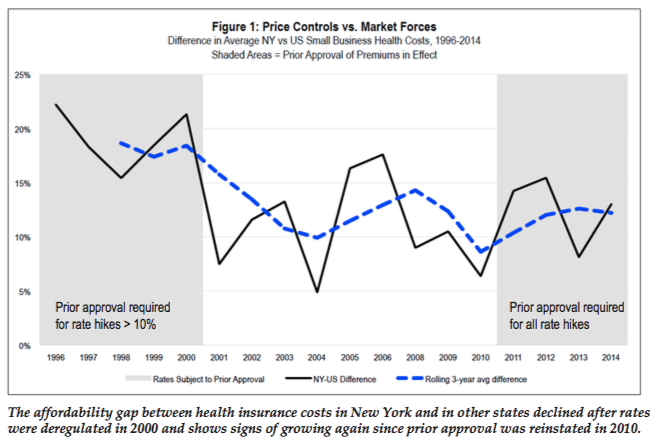 Experience has shown that regulators often succumb to political pressure to set rates too low, which can discourage insurers from doing business in New York, reduce choice and, ultimately, make coverage less affordable. In 1995, then-Gov. George Pataki pushed through a repeal of rate-setting, instituting in its place a system of minimum medical loss ratios. In the name of providing a smooth transition, the law initially capped increases at 10 percent unless approved by regulators. The Legislature did not extend the 10 percent cap after it expired in 2000. The study showed that the affordability gap, or “New York difference,” stayed high from 1996 through 2000, possibly because insurers tended to set rates as close as possible to the 10 percent cap. (See Table 3 at left.) But the difference dropped markedly after the law completely expired, suggesting that market forces kept prices in check more effectively than state regulation. Updating that same comparison through 2014 shows that the gap fluctuated considerably before dropping to 6.4 percent in 2010, just as lawmakers were voting to bring back prior approval. Since 2011, when the reinstated law took effect, the gap has returned to double digits in three of four years. So far, there’s no clear trend either way, but certainly no justification for the ham-handed solution of price controls. Still, what Health Republic did report was worrisome enough: steady losses, heavy debt and mushrooming dependence on a federal risk management subsidy that failed to materialize after Congress stipulated that it could not be backfilled with public funds. Moreover, it was a brand-new company, built on an untested model, navigating the unpredictable tides of a rapidly transforming health-care system. If DFS spotted these red flags, it took no obvious steps to address them. What it did do was further reduce Health Republic’s inadequate premiums, in the name of a regulatory system with no demonstrated record of achieving its stated goal of promoting affordability. As DFS officials and legislators study what went wrong, they should recognize that prior approval is a dangerous and possibly counterproductive distraction from what should be their primary mission: preventing the next insurance plan collapse. If the goal is making health coverage more affordable, the surest way to achieve that objective is not for the state to impose price controls, but for it to roll back its own high taxes and costly coverage mandates. 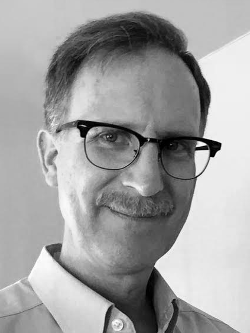 Bill Hammond is a longtime journalist with more than two decades of experience covering New York State government and health policy. * The author sought clarification from the agency about its handling of Health Republic’s financial crisis and its ongoing investigation. A DFS spokesman declined to comment. 12. H.R. 83, Sec. 227, https://www.gpo.gov/fdsys/pkg/BILLS-113hr83enr/pdf/BILLS-113hr83enr.pdf#page=362. 16. Health coverage for large employers, which typically self-insure, is exempt from many state regulations under the federal Employee Retirement Income Security Act. State regulators should have foreseen collapse of NY’s Obamacare co-op. Insurers’ fiscal soundness, not rate cuts, should be focus of @NYSDFS. NY’s current approach to regulating health insurance hasn’t worked.